You are currently browsing the MSBLOG weblog archives for July, 2006. Happy Birthday MSBLOG-1 Year OLD!! Wow…its hard to think that one year ago today we were making the first posts on MSBLOG and introducing ourselves for the first time… A couple of months before I had just been accepted into the Microsoft windows server 2003 R2 beta. I was a young naive tester who didn’t know one single tester in amongst this fabulous group. Everyday I would check newsgroups and make the odd post. One day I stumbled across a post made by a one Patrick Elliott with pictures of his sweet server test setup (i still have them somewhere). Fascinated I added him to messenger… The two of us got talking-it seamed we shared common interests etc-one thing lead to another and we became good friends. Patrick introduced me to Jabez-we ‘clicked’ and also became good mates. I was then introduced to Andre N & Joseph-now both good friends of mine/us. From there we all met Zack-a guy who was pretty clued up on Microsoft in general. Then I met Dennis (because he claimed he submitted 100+ bugs for server within a day [I didn’t believe him, but boy was I wrong ]-the competition between Andre N and Dennis was on for most bugs submitted.) Dean later joined the team after reading our blog and getting in touch with us. MSBLOG continued to grow…new themes were applied and bloggers came and went. (ill name you new guys laterÂ =]) Finally the day windows server 03 r2 ended (how I miss that beta :'( ) We migrated to windows codenamed longhorn (so we see each other day to day still) MSBLOG is still going and growing. With the upcoming mandatory update of Internet Explorer 7 via Windows UpdateÂ for Windows XP and Windows Server 2003 soon after the final version of the browser is released (planned for fourth quarter 2006),Â Â many System Admins will be up in arms (especially the ones that loathe IE). Never fear Microsoft have released a patchÂ making a non-expiring Blocker Toolkit available for those organizations that would like to block automatic delivery of Internet Explorer 7 to machines in environments where Automatic Updates is enabled. The Blocker Toolkit will prevent machines from receiving Internet Explorer 7 as a high-priority update via Automatic Updates and the â€œExpressâ€ install option on the Windows Update and Microsoft Update sites. The Blocker Toolkit will not expire. The Blocker Toolkit will not prevent users from manually installing Internet Explorer 7 as a Recommended update from the Windows Update or Microsoft Update sites, from the Microsoft Download Center, or from external media. Organizations do not need to deploy the Blocker Toolkit in environments managed with an update management solution such as Windows Server Update Services or Systems Management Server 2003. Organizations can use those products to fully manage deployment of updates released through Windows Update and Microsoft Update, including Internet Explorer 7, within their environment. Another secret little live page (live labs)Â has popped up overnight. With all sorts of informationÂ regarding a new upcoming project called photosynth. send a collection to a friend. For futher information and to view a demonstration video visit the Photosynth web site. Microsoft has just made the decision to allow you to download Commerce Server for free. Â http://www.microsoft.com/commerceserver/evaluation/software.mspxÂ has the download. (Build 5465) and Windows Vista Beta 2 July Refresh (Build 5472). I know I know, it’s been one hell of a busy day for Windows Live… yes I know it all kicked off being a Monday morning and all and yes, there is still a little more of Live to come, but as yet, Windows Live Mail M7 (Milestone 7) has been rolled out to all users using the software. Got this information throughÂ work. Windows Live Favourites lets you add a website directly to your own online favourites by a one-click command. The information’s available from here (click Add Bookmarklet) of which you can right click the link or save it as a Quick Link in your Internet Explorer browser, and whenever you see something you like, simply click on it. However… why not do this with your website? Make sure that you put a target=”_blank” on the hyperlink to make sure that it opens up the Save Favourite in a new window so they keep your site in view. 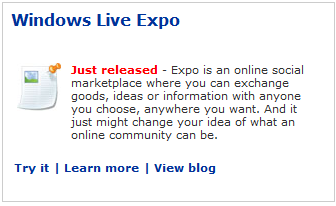 A new product joining the Windows Live shabang, is Windows Live Gallery. It’s a strange one to try and explain, even though I’ve been in the loop about it for a while now… but it’s certainly changed since I saw a prototype-type-thing. As Windows Live and Windows Vista (hense the logo’s) are being tied together in this electronic family style scene, this new Gallery which has jumped straight into public beta lets you download and upload content designed for Windows Live services, such as plugins, tools, content and media. You can also use it to download content specifically for your Windows Vista machine such as small applications designed for other parts of your Vista experience. Customise Windows Live specifically with content and plugins for Windows Live Messenger, Windows Live Search Toolbar, Windows Live Desktop Search, and over the coming weeks, more and more related Live services will jump in the loop. Posted in MSBLOG Related | Enter your password to view comments. I saw this website some time ago, and now it’s ready to be “used” as such. Dubbed “World Jump Day”, it’s designed to get people from specific places in the world to jump at a specific time on a hard surface on the ground. This is meant, so that if enough people do it (approximately 600 million), then the orbit of the Earth will shift ever so slightly off it’s regular orbit, and give us loads better stuff… no global warming, overall temperatures would go down a bit in the hottest places in the world… yada yada. REDMOND, Wash. â€” July 18, 2006 â€” Microsoft Corp. today announced the acquisition of Winternals Software LP, a privately held company based in Austin, Texas, that provides WindowsÂ®-based enterprises with systems recovery and data protection solutions in addition to offering a freeware tools Web site called Sysinternals. The addition of Winternals is a significant advance in Microsoftâ€™s promise to lower customersâ€™ total cost of ownership of the MicrosoftÂ® Windows platform. Customers will be able to continue building on Sysinternalsâ€™ advanced utilities, technical information and source code for utilities related to Windows. Financial terms of the acquisition were not disclosed. Winternals was established in 1996 by Mark Russinovich and Bryce Cogswell, who are recognized industry leaders in the areas of operating system design and architecture. Russinovich will join the Microsoft Platforms & Services Division as a technical fellow, working with numerous technology teams across Microsoft, and Cogswell will join the Windows Component Platform Team in the role of software architect. Winternals products support IT professionals in numerous ways, providing intelligent enterprise recovery solutions, network defragmentation solutions and powerful system tools, all focused on reducing the total cost of ownership for Microsoft-based businesses. Sysinternals enjoys a strong and active community of systems administrators and support personnel, averaging about a million visitors per month. Microsoft is evaluating how the Winternals products and technologies can be integrated within Microsoft offerings to maximize customer value. Founded in 1975, Microsoft (Nasdaq â€œMSFTâ€) is the worldwide leader in software, services and solutions that help people and businesses realize their full potential. Microsoft and Windows are either registered trademarks or trademarks of Microsoft Corp. in the United States and/or other countries. Another Microsoft Office exploit, Bifrose.UZ, was discovered last week. It drops a backdoor using PowerPoint (PPT) files. The exploit was discovered after a limited number of people received e-mail with the PowerPoint file as an attachment. So what’s the deal with Microsoft Office and why the exploits? There were Word fixes in June – Several Excel fixes were included in July’s patches – And now there is a PowerPoint exploit that will need to be patched in August. See a pattern? There’s a growing trend here.Â F-secure been saying for some time that the lack of large virus outbreaks is evidence that the malware environment could be getting worse, not better. The bad guys want to make money – not make attention. So as a malware author, if you want to target a few prominent companies for the purpose of industrial espionage, you design your exploit to attack them within and then lay low. Spoofed e-mails are sent to company insiders and they, thinking it’s just another document that they need to review, open it up and the backdoor gets installed. The first is the patch cycle itself. These new exploits are being released after the second Tuesday of each month to maximize its lifespan. The second is the common day-to-day routine of receiving Office files. There haven’t been any new macro viruses to speak of for some time and so Office files (doc/xml/ppt) easily pass through corporate firewalls and people don’t think twice about clicking on them. This avenue of attack is currently under the radar and is not perceived as a danger by end users. And the third advantage is that the companies exploited don’t want to talk about it. They dread the negative publicity as a victim of espionage. That’s why the public doesn’t know the name of last month’s Excel exploit victim. Such hush-hush may be keeping some of these exploits from being reported.